We’re back on Islay for another attempt at forming some appreciation for Bruichladdich. Regulars will know I find this a variable distillery. Admittedly solid enough but given the praise and fan boy enthusiasm that surrounds it, I often find the whisky mid-table and style over substance. An Islay version of Compass Box if you prefer. 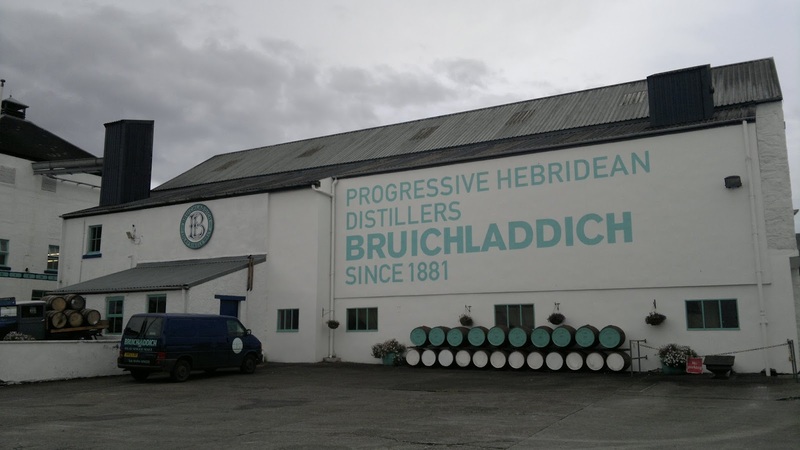 What Bruichladdich do right is focus on the terroir of their whiskies and inform their customers. Given its fairy tale rebirth and rise from the ashes it is easy to be swept away with the romance and sense of adventure. Mark Reynier who played a key part in this history has his fans, but also I know of a few scathing critics. It is easy to be swayed with stories and whisky jungle drums so for me it comes down to the whisky. This duo was kindly provided by head Bruichladdich altar boy Mark, who runs the excellent Malt-Review. If you don’t visit his site on a regular basis then I suggest you do so. My own posts here at Whisky Rover during 2016 will become more infrequent and rambling, as we go into stealth mode. As much as I know both of these are official releases and from Bruichladdich, I’ve kept the remainder of the information off-limits until after the tasting notes. Let the congregation begin. Nose: intense crushed almonds initially, some coconut and jelly wine gums. It's characteristic of the Bruichladdich's I've experienced in recent years. A creaminess is present, a touch of sulphur, lemon, char and green apples. Addition of water delivers ripe pears. Taste: very wood driven but refreshing never the less. Copious amounts of vanilla here actually too much as its really becomes overbearing and any subtle aspects are erased. Fresh yeast, granulated sugar and a little bitterness. Overall: a perfectly pleasant whisky and well-made however I just find it dull in all honesty. Exactly why I'm left unsatisfied by this brand. Oh, I'm sure it'll have unique angle they always do. And after entering the whisky info: organic eh? I've enjoyed some of the previous Organic releases plus I quite enjoyed the strength. Would I purchase it? No. Nose: the sharpness of apples, oats, actually its now moving more into toffee apples with a sticky feeling. Newly opened plasticine, almonds, freshly baked white bread, marzipan and icing sugar. Taste: lots of lemon here moving into short crust pastry and then vanilla. Solid, but I'm finding the nose more detailed. A little marmalade; a nice texture certainly. Madeira sponge cake and a sizeable barley sugar finish. Overall: perfectly fine but again to me a little dull given all the fanfare. If I was at the distillery I'd be trying to keep my poker face turned on. And after the info: sounds like an old Jaguar car eh? X4 9 or whatever, I can imagine the rapid fuel consumption and terrible looks, bad handling and driver frustration already. I've had some old East Highland malts that were filled at an exceptionally high strength and this whisky brings back those memories. So that's my mini-Bruichladdich tasting done for another few months. You can read what Mark thought about it right here. Needless to say I'm still unconverted by the distillery and I'm off to have a Glen Moray instead.